Tumor of the follicular infundibulum is a rare benign adnexal tumor arising from the follicular infundibulum. 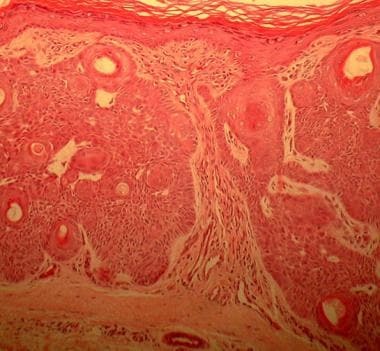 The histopathology of the tumor is distinctive, which occurs as a platelike dermal nodule with multiple thin connections to the overlying epidermis (see the images below). The tumor usually manifests as a single lesion, but an eruptive (multiple) form may occur. Tumor of the follicular infundibulum shows a platelike dermal tumor with anastomosing islands and cords with connections to the overlying epidermis and horn cysts (hematoxylin and eosin stain, 40X magnification). Tumor of the follicular infundibulum shows epidermal connections, horn cysts, and anastomosing islands (hematoxylin and eosin stain, 100X magnification). Tumor of the follicular infundibulum shows epidermal connections, peripheral palisading, and horn cyst (hematoxylin and eosin stain, 400X magnification). Follicular infundibulum tumor is a benign tumoral proliferation that arises from the follicular infundibulum. The external root sheath of the follicle has been shown to give rise to these tumors. A possible relation to sun exposure has been reported. Follicular infundibulum tumor is uncommon. Since the original report from Mehregan and Butler in 1961, only a few new cases have been reported. The overall relative frequency ranges from 3-10 cases per 100,000 specimens examined. No racial predilection is known for follicular infundibulum tumor. Most cases of follicular infundibulum tumor occur in patients older than 60 years. Mehregan AH, Butler JD. A tumor of follicular infundibulum. Report of a case. Arch Dermatol. 1961 Jun. 83:924-7. [Medline]. Koch B, Rufli T. Tumor of follicular infundibulum. Dermatologica. 1991. 183(1):68-9. [Medline]. MacGregor JL, Campanelli C, Friedman PC, Desciak E. Basal cell and squamous cell carcinoma occurring within a field of multiple tumors of the follicular infundibulum. Dermatol Surg. 2008 Nov. 34(11):1567-70. [Medline]. Abbas O, Mahalingam M. Tumor of the follicular infundibulum: an epidermal reaction pattern?. Am J Dermatopathol. 2009 Oct. 31(7):626-33. [Medline]. 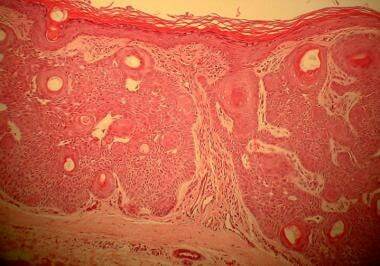 Weyers W, Hörster S, Diaz-Cascajo C. Tumor of follicular infundibulum is Basal cell carcinoma. Am J Dermatopathol. 2009 Oct. 31(7):634-41. [Medline]. Kossard S, Finley AG, Poyzer K, Kocsard E. Eruptive infundibulomas. A distinctive presentation of the tumor of follicular infundibulum. J Am Acad Dermatol. 1989 Aug. 21(2 Pt 2):361-6. [Medline]. Sartorelli AC, Leite FE, Friedman IV, Friedman H. Vitiligoid hypopigmented macules and tumor of the follicular infundibulum. An Bras Dermatol. 2009 Jan-Feb. 84(1):68-70. [Medline]. [Full Text]. Cheng AC, Chang YL, Wu YY, Hu SL, Chuan MT. Multiple tumors of the follicular infundibulum. Dermatol Surg. 2004 Sep. 30(9):1246-8. [Medline]. Martin JE, Hsu MY, Wang LC. An unusual clinical presentation of multiple tumors of the follicular infundibulum. J Am Acad Dermatol. 2009 May. 60(5):885-6. [Medline]. Cribier B, Grosshans E. Tumor of the follicular infundibulum: a clinicopathologic study. J Am Acad Dermatol. 1995 Dec. 33(6):979-84. [Medline]. Mahalingam M, Bhawan J, Finn R, Stefanato CM. 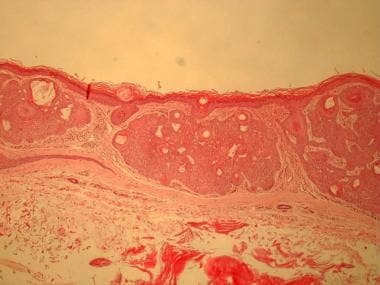 Tumor of the follicular infundibulum with sebaceous differentiation. J Cutan Pathol. 2001 Jul. 28(6):314-7. [Medline]. Kolenik SA 3rd, Bolognia JL, Castiglione FM Jr, Longley BJ. Multiple tumors of the follicular infundibulum. Int J Dermatol. 1996 Apr. 35(4):282-4. [Medline].